Distortions of a planet, star, etc., produced by the differential gravitational attraction of other astronomical bodies on parts of that planet, star, etc. The Sun and Moon combine to generate two tidal bulges in the Earth's oceans, one directed toward the Moon and the other diametrically opposite. If the Earth is assumed to be spherical and to be covered with water, then the gravitational pull of the Moon will have a different force at different points on the Earth's surface (see illustration (a)(i)). The gravitational acceleration at the Earth's center is equal to the centripetal acceleration of the Earth–Moon system. If this acceleration (which is a vector quantity) is subtracted from the surface accelerations, the differential (tidal) acceleration is found (illustration (a)(ii)), showing the two tidal bulges on the Earth–Moon line. The daily rotation of the Earth and the slower eastward revolution of the Moon in its orbit produce (usually) two high tides and two low tides every 24 hours 50 minutes. The rotation and lunar revolution are also responsible for a tidal lag between the time when the Moon crosses the local meridian and the time of high tide. 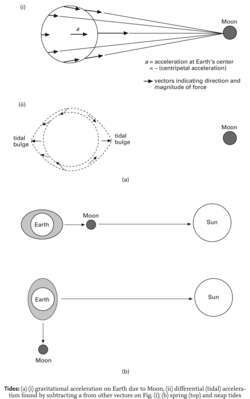 The tidal pull of the Sun is less than half that of the Moon but reinforces it at full Moon and at new Moon to produce very high, or spring tides; these tides are exceptionally high when the Earth is close to perihelion and the Moon is close to perigee (see illustration (b)). The lowest high tides, or neap tides, occur when the Moon is at quadrature. The tidal height depends on the topography of the coastline and on the area of the adjacent continental shelf. Tides are also generated in the Earth's atmosphere and in the solid Earth. Lunar tides are raised by the Earth as a consequence of the Moon's eccentric orbit. They trigger moonquakes and transient lunar phenomena. See also tidal friction. A thousand times no; and I wept tears of sweet sadness over my glorious youth going out with the tide. Trusting to the girl's skill and making no use of the rudder, he eyed the coming tide with an absorbed attention. Give me a hand with this rope, and we'll drag her up as far as we can; and then when the tide goes out we'll try another scheme. Then he turned to Yolland, and asked, "Is there any chance of finding her, when the tide ebbs again?